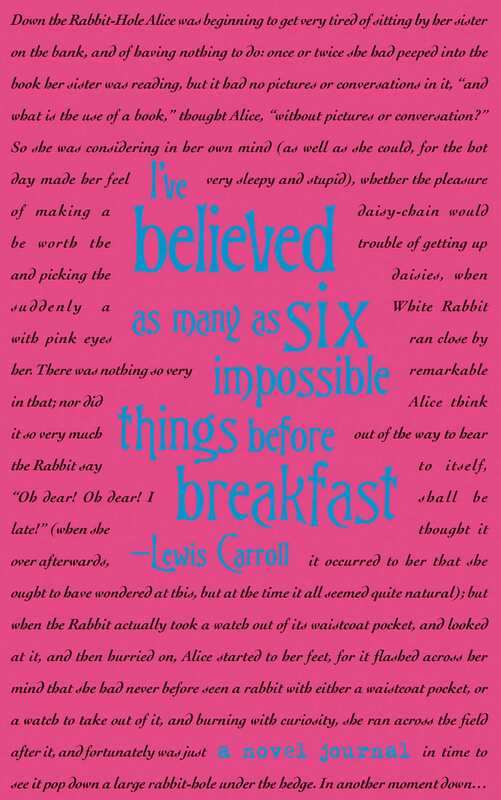 Witty, whimsical, and often nonsensical, the fiction of Lewis Carroll takes readers on a trip down the rabbit hole. In Alice’s Adventures in Wonderland, height is dynamic, caterpillars dole out advice, and a Queen of Hearts playing card orders executions as she plays croquet. Through the Looking-Glass continues the adventure when Alice steps through a mirror into another magical world where she can become queen if she can only get to the other side of a colossal chessboard. Nothing sets the mood for penning a new story like the comfort of stories that have transcended time and culture. With the text of these two classics serving as the journal lines in tiny type, A Compact Novel Journal: Alice’s Adventures in Wonderland is sure to spark your creativity whether you’re journaling or drafting the next classic. Packaged with a deluxe Svepa cover, brilliant endpapers, colored edges, and matching elastic band, this book is a great gift or collectible for admirers of Carroll’s work. And the compact size makes this journal easy to slip into a purse, briefcase, or backpack so you can record and revisit your thoughts on the go.